thanks to Jack for this article from the American Bar Association. Note that crowdfunding is what is paying for this. Short article. Also note that if we have one person one vote, CA will no longer be a "blue state" completely. The Constitution provides that "electors" choose the president and vice president, while states determine how electors are selected, the suits explain. 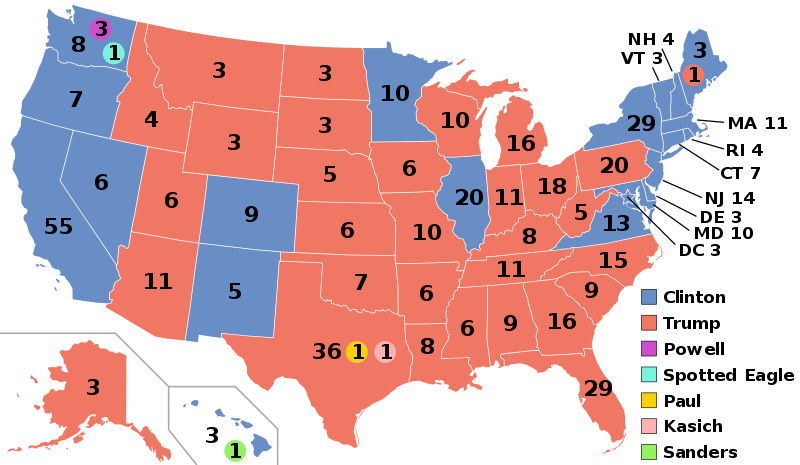 Forty-eight states and Washington, D.C., have winner-take-all systems for choosing electors in which the political party of the leading candidate selects every elector. The system magnifies votes by those who chose the winner and discards the votes of others. The system allows candidates to win the election while losing the popular vote. The suits claim the system denies citizens the right to an equal vote in presidential elections in violation of the right to political expression and association under the First Amendment and the principle of one person, one vote under the 14th Amendment. The suits also say the system places minority voters at a disadvantage in violation of the Voting Rights Act. The coalition is led by David Boies of Boies Schiller Flexner and the League of United Latin American Citizens, as a result of a crowdfunding campaign launched by Harvard law professor Lawrence Lessig. A press release announced the suits on Wednesday. "Winner-take-all is not part of the Constitution," Lessig writes in a post at Medium.com. "Winner-take-all meant that presidential campaigns were focused on a dozen states only; winner-take-all meant that the chance of a minority-elected president was high; and winner-take-all made America vulnerable to the games evil foreign governments might play, to hack our democracy and defeat majority will," Lessig writes. The suits were filed in the solidly Republican states of South Carolina and Texas and the solidly Democratic states of Massachusetts and California. Law.com, Reuters and Bloomberg News have coverage. Plaintiffs in the suits include LULAC, actor and comedian Paul Rodriguez, and former Massachusetts Gov. William Weld, who was the Libertarian Party's 2016 vice presidential nominee. Support for the suits was launched by Lessig's group, EqualCitizens.US. BigLaw firms working on the suits include Hausfeld, Alston & Bird, and Steptoe & Johnson. Also working with Boies and Lessig are former White House chief ethics lawyer Richard Painter, New York University law professor Samuel Issacharoff, and Duke law professor Guy-Uriel Charles.